Originally published in 1999, The Kodansha Kanji Learner's Dictionary has long been a standard reference work for kanji and has enjoyed the praise of renowned scholars and learners throughout the world. Now, with the addition of 772 entry characters, this best-selling kanji dictionary becomes an even more indispensable resource. "Captures the power of Japanese … and aids learners at almost every level of study in their effort to master the written language." "[KKLD] is all you could hope for and more, much more. With the brilliant and easy SKIP method … the kanji you want can be found in less than a 1/2 minute." The primary goal of this dictionary has been set high: to create a practical tool that enables the learner to gain an in-depth understanding of the most frequently used kanji in contemporary Japanese. Based on a systematic approach and a firm theoretical foundation, the new work has been designed to meet in full the specific needs of learners. We have avoided the path of least resistance taken by other works: that is, compiling lists of words and presenting only dry facts such as readings and stroke-counts, while sidestepping the difficult task of presenting accurate character meanings. This dictionary not merely accurately records the linguistic facts about kanji, but also strives to present them in a manner that gives the user insight into how they function as a system. 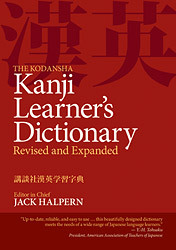 This edition incorporates all the features of its parent work, The Kodansha Kanji Dictionary: Revised and Expanded, including core meanings, detailed character meanings, strokeorder diagrams, cross-references to homophones, numerous compounds and examples, a speedy indexing system, and other features. It also includes hundreds of new entry characters based on the revised Jōyō Kanji and Jinmei Kanji lists, the most recent frequency statistics (2010), character codes, and color coding to show relationships between senses. The core meaning, which conveys the most fundamental meaning of each character, is followed by clear and detailed character meanings arranged in a manner that shows how they are interrelated. Each meaning is followed by compounds and examples that show how they are formed from their constituents. Moreover, the degree of importance for each meaning is indicated for three levels of study. The SKIP indexing system enables even beginners to locate entries quickly and with ease. Since it can be learned in a very short time, this dictionary is an extremely convenient lookup tool. In addition, several other lookup methods, such as the Radical Index and the On-Kun Index, assure maximum convenience to the user. The one feature that clearly distinguishes this dictionary—that puts it in a class of its own among kanji dictionaries—is that it was carefully designed to strike the optimal balance between two fundamentally conflicting needs: portability and comprehensiveness. On the one hand, it provides the learner with immediate access to detailed information for more than 99% of the kanji used in Japanese newspapers; on the other, it is compact and light enough to be easily carried around in one’s handbag or briefcase. These and other features distinguish this dictionary as the most in-depth kanji learner’s dictionary ever compiled. This was achieved by making full use of the most recent advances in linguistic science, computational lexicography, and digital publishing technology. This dictionary offers a detailed treatment of the meanings and functions of the most frequently used kanji in present-day Japanese, with particular emphasis on contemporary usage and newspapers. It contains 3,002 main entry characters and approximately 46,000 senses for some 35,000 words, word elements, and illustrative examples. 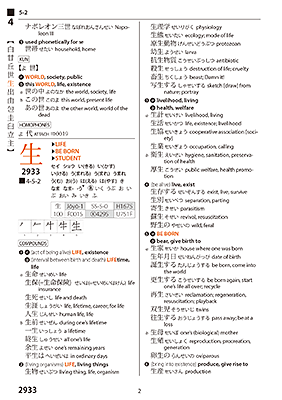 The entry characters include (1) the 2136 characters in the official Jōyō Kanji list, which are widely used in the media and education, (2) the 861 characters in the official Jinmei Kanji list, used in names, (3) 5 alternative forms officially approved in the Jōyō Kanji list, and (4) 748 cross-reference entries. This covers more than 99% of the most frequently used characters, which is adequate for meeting the needs of the serious learner. High-frequency compounds based on statistics compiled by the National Language Research Institute in the official survey A Study of Uses of Chinese Characters in Modern Newspapers. All compounds normally written in kanji that are listed in Ten Thousand Graded Japanese Words (一万語語彙分類集), published by Senmon Kyōiku Shuppan. Thousands of additional compounds necessary for illustrating the meanings of the new characters added to the revised Jōyō Kanji and Jinmei Kanji lists. Numerous other compounds useful to intermediate and advanced learners, selected on the basis of their ability to illustrate the entry character’s meaning. Kanji can be combined to form countless compound words by affixation. Only typical examples of these innumerable compounds (e.g., 校正済 こうせいずみ ‘proofreading completed’ from 校正 + 済) are given, since it is easy to infer their meanings. Many nouns are turned into verbs by adding する, into adjectival nouns by adding な, into adverbs by adding に, and so on. The part of speech selected was based on importance and on its ability to illustrate the entry character’s meaning. This policy is sometimes misunderstood by those who compare dictionaries on the basis of the number of words included. Let it be clear: the primary emphasis has been on completeness in terms of quality, rather than comprehensiveness in terms of quantity; that is, to include compounds that directly contribute to an understanding of character meaning. All approved readings (those in the Jōyō Kanji list), and their derivatives when necessary, have been included. Name readings, used exclusively in proper names. Common as well as many rare readings for characters not in the Jōyō Kanji list. An important feature of this dictionary is the descriptive approach it takes to the selection of readings, which includes validating occurrences in the living language while avoiding the common practice of including readings merely on the authority of sources. For example, though various dictionaries claim that 茄 has the on reading ケ, this is nothing more than a historical ghost copied from outdated dictionaries. On the other hand, we have included readings, such as マン for 幡 and ジャン for 雀, that rarely if ever appear in dictionaries but are actually frequently used in contemporary Japanese. The analysis of character meanings was inseparably linked to the analysis of kanji synonyms. As Ladislav Zgusta, the world-renowned authority on lexicography, has pointed out, the lexicographer cannot really know the precise meaning of a word unless it is examined in comparison and in contrast with its near-synonyms. In this dictionary, the analysis of kanji synonyms was firmly based on such a policy, which served as a powerful technique for establishing character meanings of high precision and clarity. An important contribution of this dictionary is that it lists many compounds and character meanings, and sometimes even readings, that have never appeared in any character dictionary, including comprehensive dictionaries for native speakers. For example, character dictionaries report that 雀 means sparrow’and has an on reading of ジャク and a kun reading of すずめ. In actual fact, 雀 is frequently used in the sense of ‘mahjong’ in compounds such as 雀卓 じゃんたく ‘mahjong board’ and 雀荘 じゃんそう ‘mahjong club’. Neither the reading ジャン, nor the meaning ‘mahjong’, nor any of these compounds, are recorded in any of several dozen dictionaries that were surveyed in the late 1980s. In another survey conducted a quarter of a century later (late 2012), we have still not found a single dictionary that lists 'mahjong’ as a meaning for 雀. Years of struggling with self-study using traditional methods of rote memorization inspired the chief editor to embark upon the compilation of a new kind of kanji dictionary in 1974. Sixteen years later this culminated in the publication of the Kenkyusha New Japanese-English Character Dictionary (NJECD). The present dictionary, The Kodansha Kanji Learner’s Dictionary: Revised and Expanded (KKLD), is the latest addition to Kanji Integrated Tools (KIT), a series of computer-edited dictionaries and software applications for the study of kanji. It is based both on NJECD published in 1990, as well as the first edition of the present dictionary, The Kodansha Kanji Learner’s Dictionary, published in 1999 by Kodansha International. The latter has become a standard reference work for the study of Japanese and enjoys an excellent reputation among scholars, educators, and learners of Japanese throughout the world. The KIT project was first launched with the establishment of the Kanji Dictionary Publishing Society (KDPS) in 1993 under the auspices of the Institute of Modern Culture at Showa Women’s University. The Society, headed by Showa Women’s University president Professor Kusuo Hitomi, was financed by the university and other organizations. It was directed by the Editorial Committee, which included Japanese-language education specialists such as Professor Osamu Mizutani, the former president of the Society for Teaching Japanese as a Foreign Language. KIT dictionaries have benefited from the support of various government organs, educational organizations, and government officials such as Japan’s former prime minister Yasuhiro Nakasone, the Japan Foundation, the National Council on Educational Reform, the National Institute for Japanese Language and Linguistics, the Board of the Association for Japanese-Language Teaching, the Society for Teaching Japanese as a Foreign Language, and the National Language Society of Japan. In the next phase, a series of foreign-language editions, including Portuguese, Spanish, German, French, and Indonesian, will be published, as well as other useful learning aids such as smartphone applications. Through these activities, we aim to offer a comprehensive solution to the diverse needs of learners, educators, and researchers. We invite scholars around the world to contribute to this ongoing effort.